The Junior Pirates kicked off their 2017 campaign with a pre-season friendly against touring Canadian side, Selwyn House School Gryphons. The first problem to overcome was which version of the game to play. Domestically, Junior football is 9v9 but the Canadians are used to playing 12-a-side. A compromise was struck, and US NCAA rules agreed with 11 players on each team. Next, was obtaining a suitable venue. With all their regular locations unavailable for one reason or another, the Pirates’ home for the day was at the University of Stirling’s Gannochy Sports facility. The visitors kicked off and a short return by Callum Ferguson took the ball to the 29 yard line. Two carries by running back Jack Hunter, followed by two from Matt Irvine moved the ball into Canadian territory. QB Sam Montgomerie then connected with Fraser McDonald and later with Struan Bailey to move the ball to the 11-yard line. However the drive stalled there and the ball was turned over on Downs. The Gryphons made steady progress but just as they moved into East Kilbride’s half a fumble lost big yardage and they eventually had to punt. Despite a good run from Hunter, the Pirates also had to punt, and that kick brought an end to the first quarter. Following the turnaround, Selwyn House used their ground game to progress upfield. After 6 runs and an incomplete pass, they took the lead when Rocco Christiano completed a 27-yard pass to Joseph Chaloub. Vitorio Guzzo added the PAT to give the Québécois a 7-0 lead early in the second period. The Pirates bounced straight back, again using Hunter’s strong running, assisted by Will Price, to work the ball inside the red zone. Montgomerie once more found McDonald to move the ball to the 7-yard line. However, despite another completion, this time to Martin Gallagher on fourth-and-goal, the play came up short. With the Gryphons backed up near their own goal line, the Pirates went looking for a Safety, but a roll-out pass by Christiano sent his receiver speeding down the sideline. Only a last-gasp ankle tackle by Aidan Gallacher, showing a remarkable turn of speed to close in from the opposite side of the field, saved the touchdown. The home defence duly stood strong and forced their opponents to settle for a 22-yard field goal attempt. Guzzo’s kick was blocked as the half expired. Both teams traded punts at the start of the third quarter, then a forced fumble and recovery by Kyle Gold regained possession foe EK. Unfortunately, two successive high snaps saw the Pirates lose 15 then 8 yards respectively, with the latter going out the back of the endzone for a Safety. The visitors stretched their lead further on the next drive, taking only three plays before QB Jade Boucetta found Charles Culver in the endzone for a 22-yard TD. Guzzo’s PAT was blocked, leaving Selwyn House 15-0 ahead. In the final period, Defences on both sides were well on top, with possession swapping back and forth no fewer than six times. Pirates QB Lewis Smith completed passes to Bailey and to Jack Cochrane for good yardage, but it wasn’t enough to keep drives alive, and the Gryphons held the ball as the game came to an end. 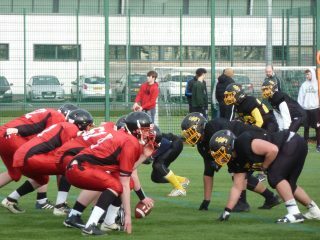 The Juniors now look forward to another pre-season friendly, this time against Leeds Assassins juniors, and then their Training Camp at the beginning of April before the start of their League Season.